Shadywood Cottage was built by Susan Welker Adams in 1903 and has been owned by the same family through four generations. Take a trip to a more peaceful time in this charming, campmeeting community filled with many Victorian gingerbread-trimmed cottages and quiet walking streets. Mt. 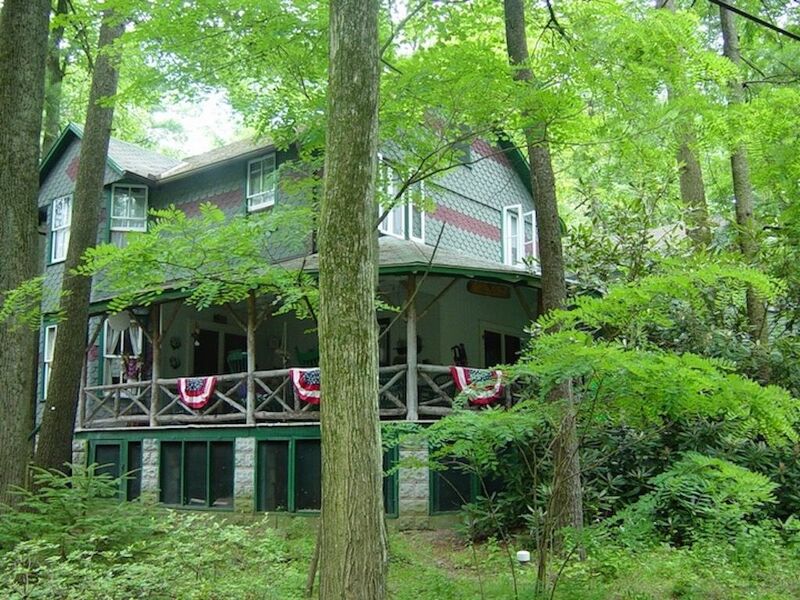 Gretna is a storybook lake community only 14 miles from Hershey, Pennsylvania. The town has a world-renown summer theater, an equally famous concert series, and is host to one of the best art shows of the summer. This spacious Cottage has 5 bedrooms, 2 baths (1 upstairs / 1 downstairs), washer dryer on the first floor, and wifi. There is private covered parking for up to 3-4 cars and a gas grill. The cottage is not air conditioned, but has ceiling fans in every room upstairs and down, and on the wrap around porch. The first floor has a fully functional kitchen with dishwasher, large living room and a dining room with seating for up to 10. The huge porch wraps around the cottage and includes a swing and many rockers to enjoy the sights and sounds of those warm Mt Gretna nights. Upstairs has five rooms with a full sized bed in each, plus 2 sets of bunk beds and a crib. The cottage comfortably sleeps 14, perfect for large family gatherings. There are ceiling fans in every room. The walls in the bedrooms only rise 7 feet so the old time roof structure is exposed. Guests say they love lying in bed looking at the old wood and hearing the kids conversations in the next room. Mostly all the cottages in Mt. Gretna have 5/8" old chestnut or hard pine interior walls (wood no longer available) so sound does travel freely. If you're bringing uncle George who snores like a freight train going up an Allegheny Mountain you might not want to stay in Mt. Gretna (or get him a hotel room) as all cottages were originally built as summer cottages from 1892 through 1915. There are three restaurants and an ice cream parlor within walking distance. The Jigger Shop Ice Cream Parlor has been in operation since 1895. There is also a nostalgic roller rink and miniature golf, and Mt. Gretna lake that are seasonally open. This property was built by my great grandmother, Susan Welker Adams, and has been passed down in my family across four generations. We can accommodate 5 cars. Perfect location and amazing porch. A wonderful house and location. The only tho g missing is air conditioning. If not for the extreme heat it was amazing. Quiet, peaceful cottage. The porch was fabulous! We had dinner on the porch every evening. (Even when it rained) The amenities provided in this cottage made it extra nice. It was a great family get away! This house is in the cutest area. I felt like I was living in a fairy garden. The house remained cool without air conditioning in the hottest weather, and the porch was a sheer joy for family dinners and relaxing evenings. I was also impressed with the many things I found in the house that I had expected to have to supply. Garbage bags, toilet paper, dish soap, facial tissue, shampoo. My family and I really enjoyed our stay here. So glad you and your family enjoyed the cottage. Mt. Gretna is a unique place. We hope you will stay again. So glad you and your family enjoyed the cottage. Wonderful weekend with family and friends. Plenty of room and memories for everyone. Step back in time with this spacious cottage in Mt. Gretna. Bring your family, friends and respect for the simple way of life. While this is a seasonal cottage, there is enough modern amenities to make your stay enjoyable. If you are looking for 5 star hotel, please stay there as this is reserved for a different type of vacation. You are vacationing in a community, where there is quiet, respect and neighbors that smile and say good morning on your walk around the Camp Meeting grounds. Bring your family to a place that they will never forget. There are modern amenities to this cottage that will make your stay enjoyable; 2 bathrooms and great parking, dishwasher, washer & dryer, towels and bed linens, grill, and central location. Let's talk about that porch...it's a large gathering place that will provide hours of entertainment, conversation, board games and laughs. Even if the day is rainy you still have the option of a space to visit and relax. I highly recommend the rockers! You can always stay in a chain hotel...or you can stay in Mt. Gretna and create memories. Thank you so much. Glad you enjoyed your stay. I spent every summer of my childhood at the cottage and have wonderful memories too. There is a non-refundable pet deposit of $100 per pet, up to two pets.